Happy Friday!!! Anyone have any big plans this weekend?? I have another low key weekend planned which will be my last one for awhile, so I plan to enjoy every relaxing minute of it. 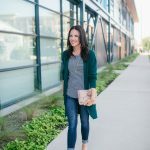 If you have been looking for a great long sleeve lightweight sweater to wear on weekends, I have found it ya’ll. 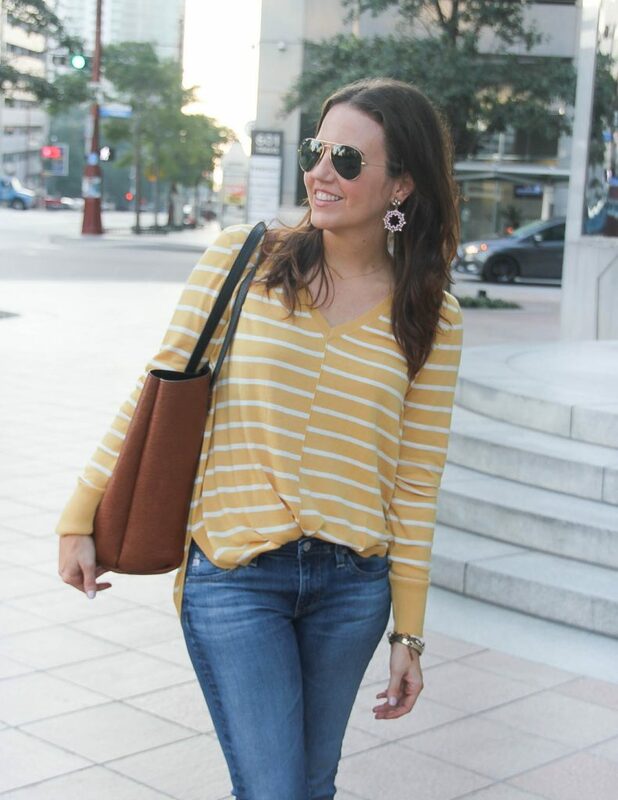 I originally ordered this yellow striped sweater because I loved the shade of yellow. Once it arrived, I realized I could probably live in this sweater. It’s an oversized high/low fit which is super comfy, but the sleeves are fitted. Fitted sleeves on an oversized sweater is super cozy and comfy for me. 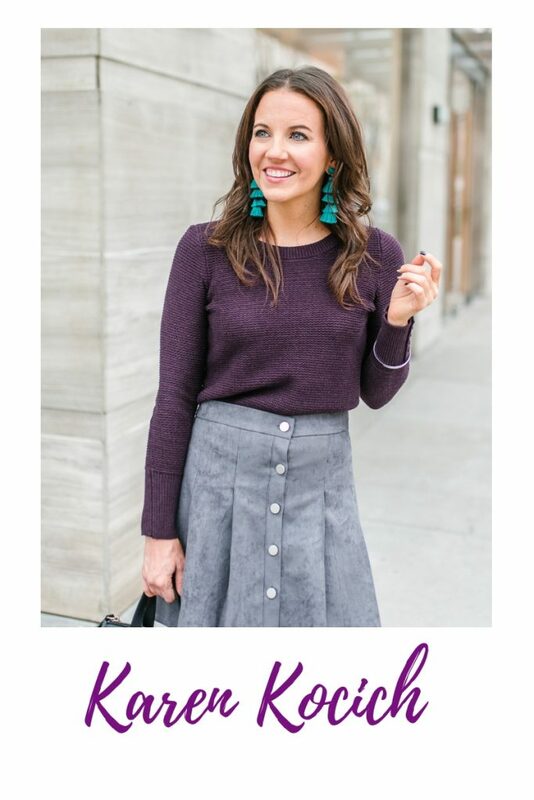 With oversized sweaters, I like to do a little front tuck to give the overall look a little shape. I made sure to shoot a couple photos untucked too, because it looks cute that way too. 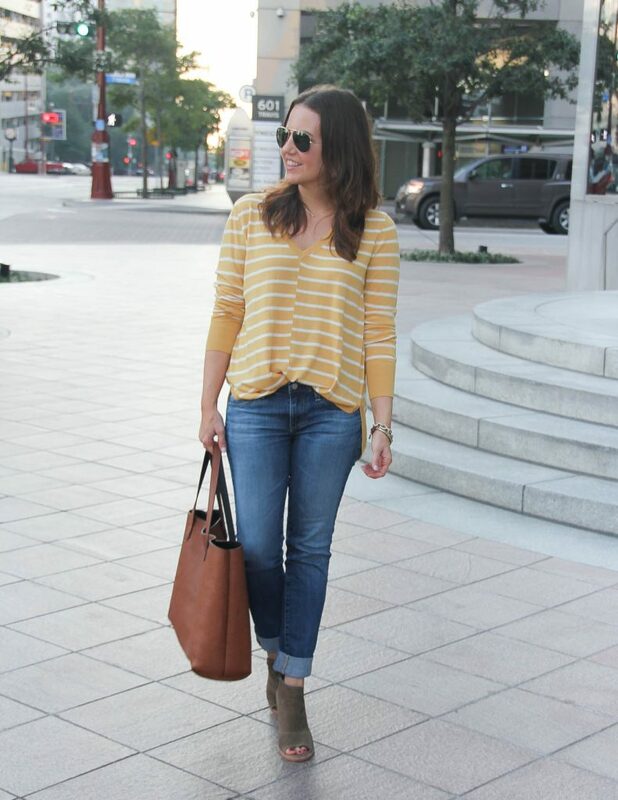 This yellow sweater is also perfect to pair with shorts (worn that way here) and wear on warmer weekends. Hello Texas fall! Also, I have to mention this sweater comes in a few other colors options too. 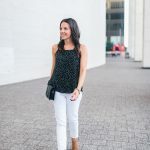 I’m seriously debating the black and white one, because this is one of those tops that will be wearable for many fall and winter seasons ahead. I paired this yellow shade with these cute pink earrings, because I love the pink and yellow color combo. I think the pink earrings slightly dress up this more casual fall outfit too. I hope everyone has a great weekend! See you guys back here next week! Ooh that does look like a great sweater. I love anything striped, but I don’t have yellow stripes. Now I think I need them in my life! Such a great cozy fit too. 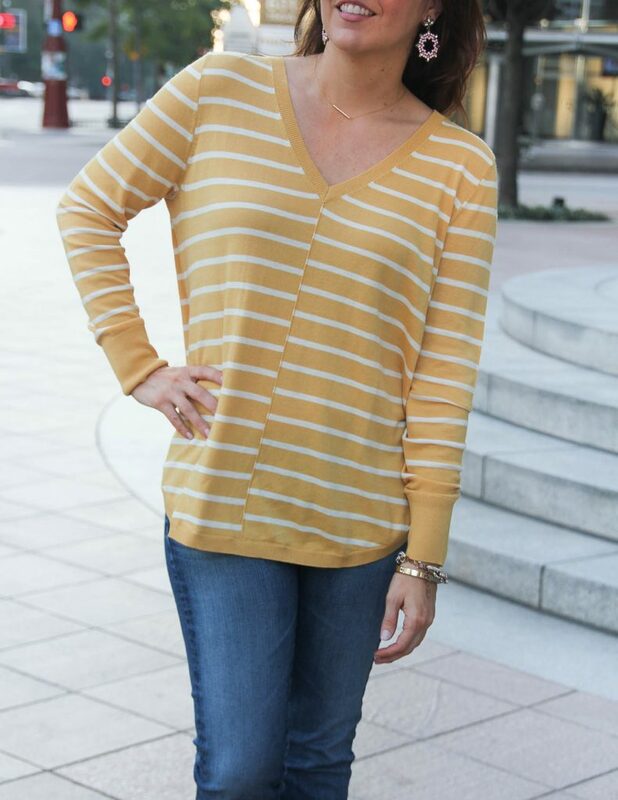 I love this striped yellow sweater! I always get excited when fall rolls around and I can begin to wear comfy clothes like this. However, the yellow striped detailing definitely dresses the outfit up and makes it perfect for any occasion. I love the pop of color! 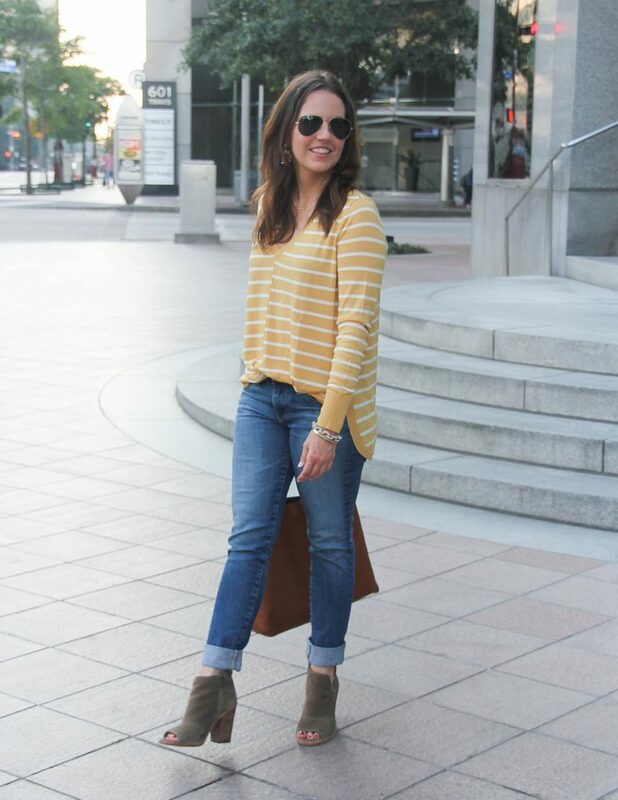 Oversize sweaters with fitted sleeves are definitely my fall go-to tops. 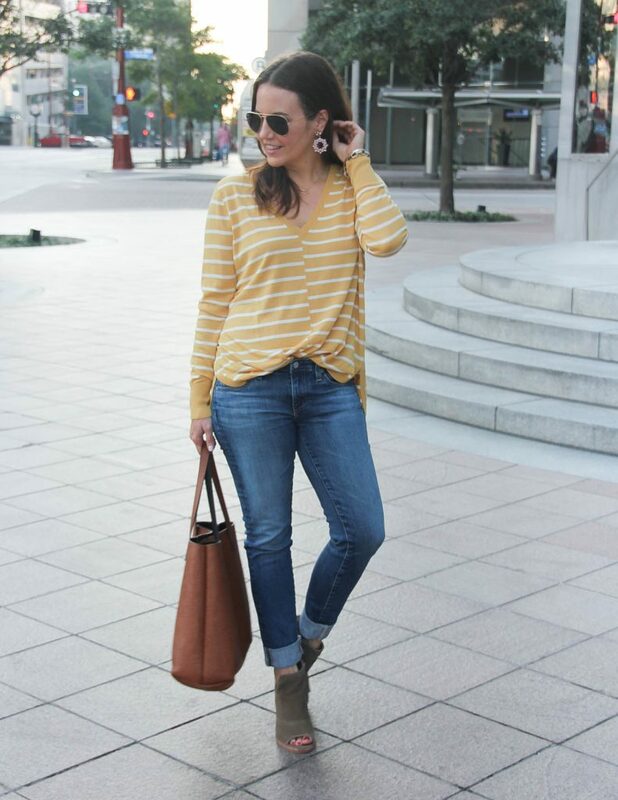 They’re so flattering and always look great with skinny jeans. This yellow is really pretty on you! 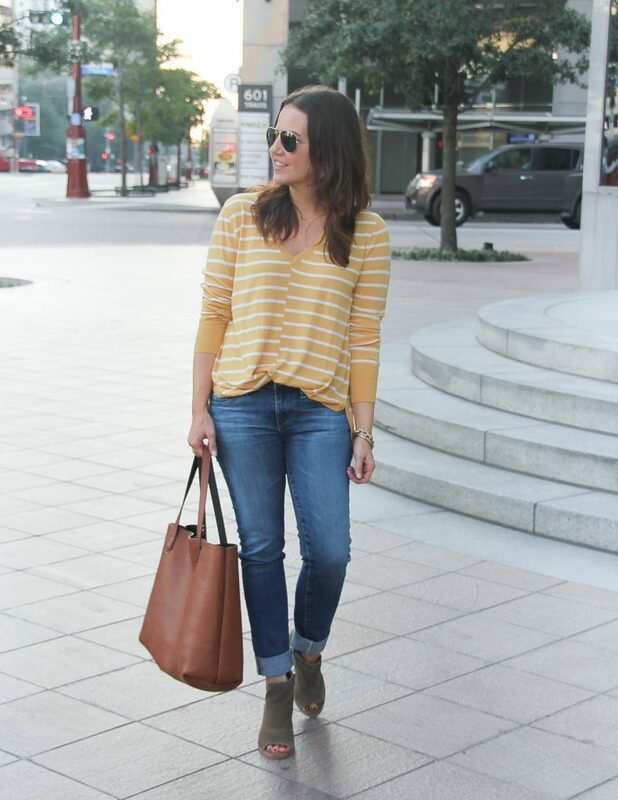 Love the soft yellow on this striped top. Also the jeans look so comfy and fit you so well. I love the rolled cuff to show off the mules! 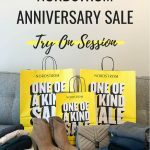 What size are you wearing in the sweater? Too cute! Love that sweater and booties. I never thought of tucking in an oversized sweater. I’ll have to try it sometime. Great sweater, love the booties!